I am 50 and have some back problems so easy entrance and exit from the vehicle is an issue. As it is, I find it easier to enter/exit the Fiat 500 than a Lexus NX. Which is too bad because the Lexus' seats are the most comfortable. I really do not like BMW's seats. I want good mileage (combined). Heated and ventilated front seats. Memory seat. Reliability is also important. I want to buy a vehicle with 5 years payments and keep it a sixth year. Regular fuel is preferable to premium. At this point I am considering the Buick Envision and the Lincoln MKC. Which would be the better choice and why? Any other suggestion? Hi - How about an Audi Q5 or an Acura MDX? We've owned both (still have the Q5) and they are both very nice cars. Our Q5 is a TDi (turbodiesel) and has averaged 31 mpg in 35K miles since new, remarkable for a 4000-lb SUV that will hit 60 mph in less than 6 seconds. Its ride is just about perfect, IMO, and it's an amazingly comfortable, quiet cruiser.The 2.0T (turbo 4-cyl) and 3.0T (supercharged V-6) models are nice as well. 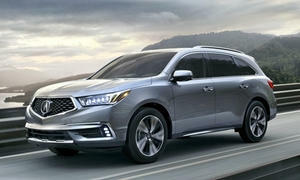 The new MDX is also a nice car, more refined than the 2008 that we owned for 8 years and 120K miles. They've just introduced a hybrid version that is both more powerful and more efficient than the standard model, offering some 320-odd horsepower combined with 26 miles per gallon average fuel efficiency. It's quite nice inside, with very comfortable, supportive seats. Both are well worth a look and/or test drive. Thank you for your comments. I find the Q5 tempting. It may depend on the financing rates that they offer (currently too high) when I get to that. The MDX is too long to fit in my garage (I am in Quebec and park in the Garage from October to April so it is always warm when I sit in). The Acura RDX might also be worth a look, depending on what's important to you. We just bought a used 2014 model, and it represents good value for money whether new or used. It's certainly not the equal of our Q5, but it's at least $10,000 less expensive, comparably equipped. The front seats deserve a special mention - like the MDX's, their very comfortable and supportive. Its 3.5L V-6 has AMPLE power, and is decently fuel-efficient as well. It's ultimately not as refined as it might be, but it IS a value play in the segment. 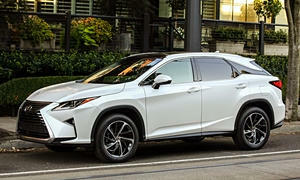 If I were you, I would look at the Lexus RX and Acura RDX. The Lincoln MKC has been very unreliable and the Buick Envision is not very luxurious and is a poor value. Lincolns are more expensive Fords and Buicks are more expensive Chevys. The Lexus RX might have a different feeling than the NX of accessing the car that might not hurt your back. It's one of the most reliable new cars (because it's a Lexus) and it's very luxurious and comfortable with great seats. The Acura RDX is getting a little old, but it's reliability has been pretty good, it's seats are very comfy, and it's pretty fast. The interior could use an update IMO. Both the Acura and Lexus are not very easy to see out of, but they both have backup cameras standard. Given how much I like both Lexus, I'd take the Mercedes GLC because they did a great job on that car, way better than their past SUVs. The GLC also got Motor Trend's car of the year award. If you REALLY want a good value, look at a 2017 Kia Sorento fully optioned. You won't be disappointed. 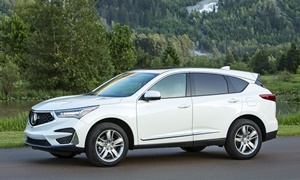 The first vehicle that came to mind when I read your post was the Acura RDX. It is very much the "jack of all trades" compact luxury CUV. It isn't exceptional in any one area, but it is incredibly competent in almost every category. It is comfortable, very well-built, reliable and a pleasure to drive with a strong V6 (instead of the 4-cylinder turbo in most competitors). It's well worth a look. I would also recommend taking a look at the Volvo XC60. You will not find more comfortable seats in a CUV (or any car for that matter). It's a pleasure to drive thanks to the ride quality, solid build, excellent handling and strong engines. It is obviously safe (it's a Volvo) and it gets great fuel economy for the compact luxury CUV class (EPA estimates of 20/29 for AWD models). You mentioned that you'd previously owned the Merdedes-Benz GLK and loved it. 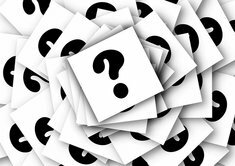 Is there any reason you aren't considering the M-B GLC as a replacement? The smaller GLA and GLC took the place of the GLK, with the latter being the larger and much better vehicle. The GLC is based on the E-class chassis and it is held in high esteem by the automotive media. Earlier you mentioned the Buick Envision and Lincoln MKC as possibilities. I would urge you to think very carefully before choosing either. 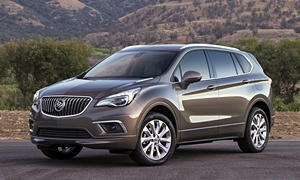 The Buick Envision has been described as underdeveloped and overpriced. It lacks in ride comfort but also suffers poor handling and lacks nosie isolation expected of Buicks and models in this class. It also has an abrupt stop/start system, the inteiror has some hard, cheap plastics and hideous fake wood and the front seats are flat and lack any sort of thigh or hip support. The fit-and-finish of some test cars has been subpar and the concerns over one of the first Chinese-built exports to the U.S. raises some red flagees. The Lincoln MKC isn't as good as the less expensive model it is based on- the Ford Escape. THe MKC is about 450lbs heavier than the Escape and it pays for that heft in handling, braking distance, acceleration and fuel eeconomy. Despite the soft handling and extra weight, ride comfort is not up to the traditional Lincoln standards. The inteiror is nicer than the Escape at first glance, but not nearly enough to justify the price difference. The MKC has not been very reliable to date either. If a luxury badge isn't a requirement, take a look at the top-of-the-line Ford Escape Titanium. You can get most of the features on the MKC for a lot less money in a much better package. It also looks better to my eyes, although that is subjective. If you are actually open to a Ford-branded vehicle, an even better choice would be the Ford Edge Titanium. A final note about the Audi Q5. I've had a Q5 rental two times in the past and I love them! 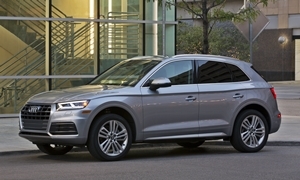 The 2018 Q5 is totally redesigned, so deals on 2017 models will be likely very soon. This squarely focused on a 2016 Buick Envision Premium ll found used for mid-$30's with a few thousand miles. It has standard AWD with torque vectoring and a new twin disk differential that allows one wheel with traction to pull the car. Something you won't find on most CUVs under $50,000. It can park itself, has hands free lift gate, heads up display (HUD), vented front seats, four heated seats, adaptive cruise control, articulating hid headlights, auto braking front and rear, surround camera.... The Envision goes through Consumer Reports accident avoidance test as fast as a $60,000 Jaguar Fpace. The braking from 60 mph is the best in the segment at Car & Driver. We really enjoy our Envision Prem ll and are loving the quiet, smooth ride, and over 30 mpg on the highway.